You are currently browsing the category archive for the ‘Snare Drums’ category. I just uploaded another Sara B drumcam video on my Youtube page. That’s not really the point of this post, but I’m mentioning it because at 2:20 in the video you can see my tech Kris Mazzarisi in all his glory. Kris rules. I think I’ve mentioned him before on this blog. He’s the one that set up the GoPro for the drumcam footage in the first place. 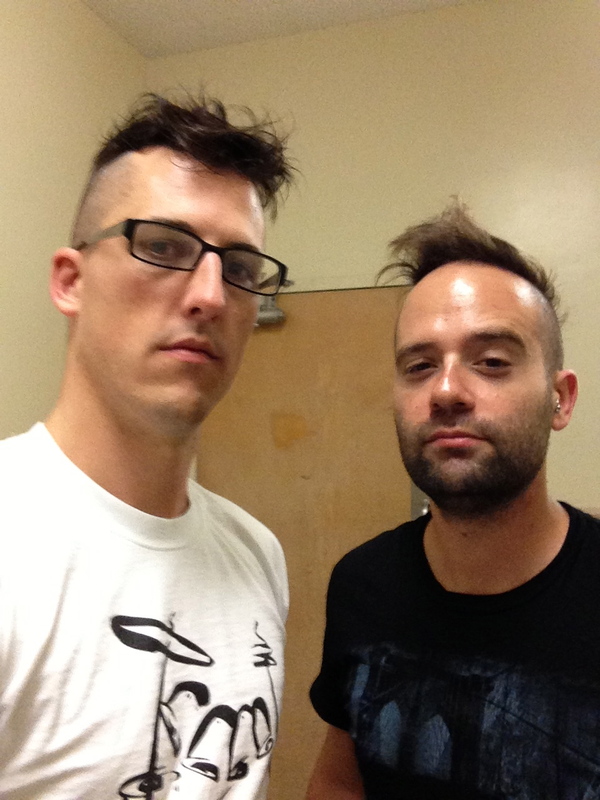 Kris and me on the fall tour, complete with matching haircuts. 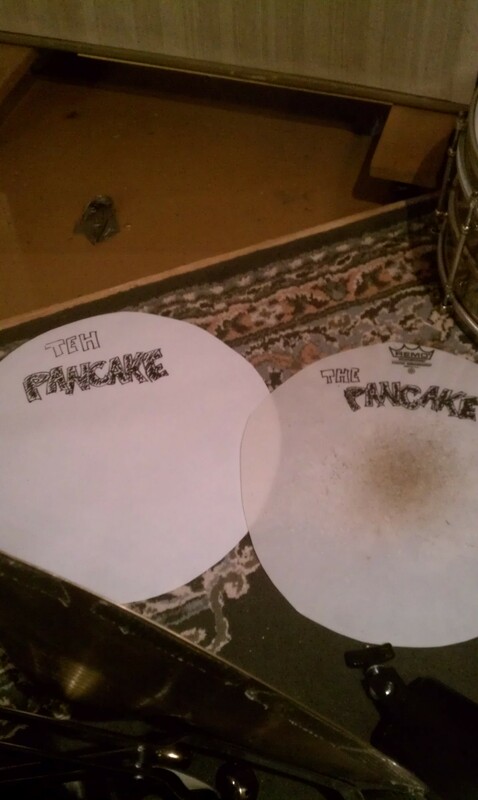 Ok… now to the real point of this post: anybody remember The Pancake? It’s my cut-out drumhead snare muffle. 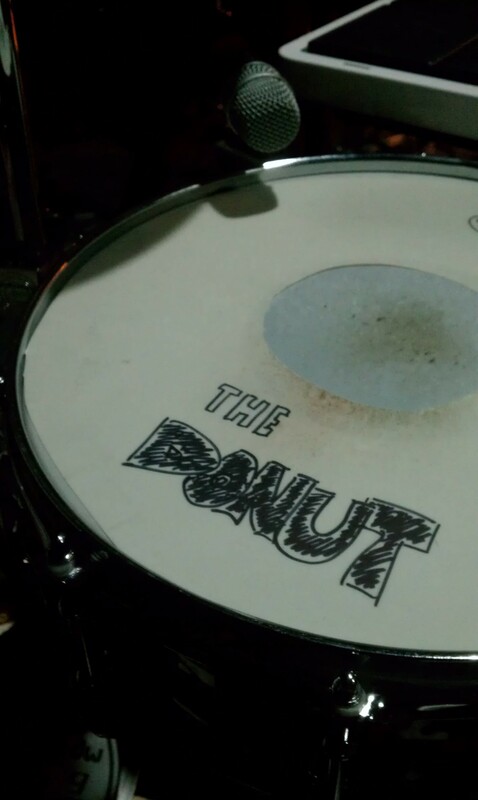 I also use one with the middle cut out, which I call “The Donut.” I’ve been using muffles like that for years and so have a lot of other drummers, so it’s not really a “new” thing. But then Kris Mazzarisi comes along and, with his trademark attention to detail and overall awesomeness, completes the design with a durable rubber outer right and a notch for easy placement/removal. 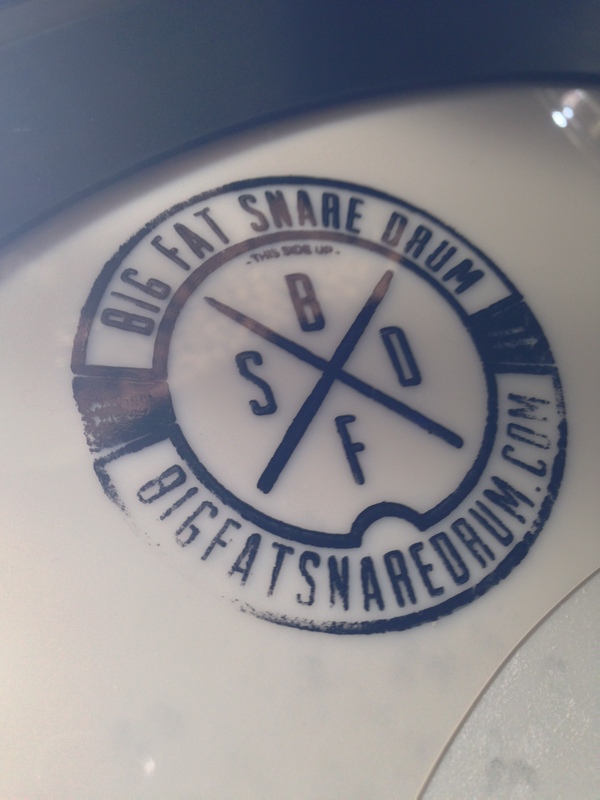 And now Kris has started a company called Big Fat Snare Drum to market and sell his patented designs, even naming the version with the hole in the center “Steve’s Donut.” He came up to my hotel room at our last gig to show me the “Steve’s Donut” prototype and tell me he was calling it that. I totally teared up and I feel honored to even know such a cool and selfless dude. The moral of the story is: you need to go buy the BFSD “combo pack” immediately. DO IT NOW. You can also keep up with BFSD on Twitter or Facebook. Sara giving a BSFD prototype to Questlove when she performed on Fallon a few months ago. 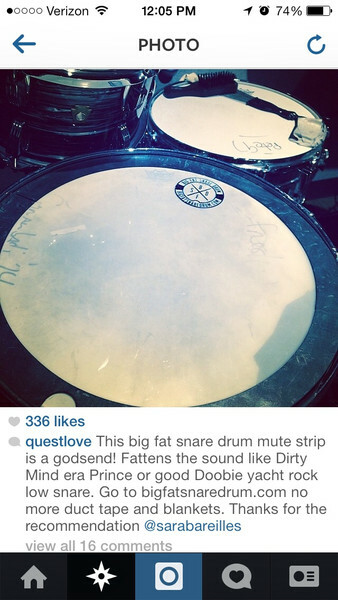 Questlove’s Instagram post after using his BFSD prototype. 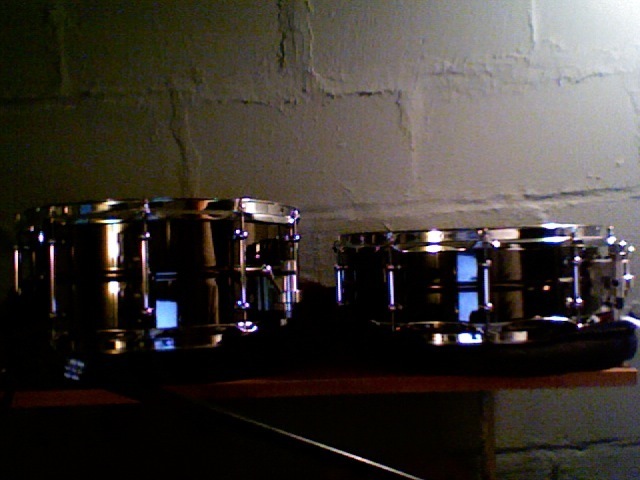 Part of my snare arsenal from a few years ago. The recording studio is a very specific environment, and certain snare models have, throughout the years, shown themselves to be ideal for studio work. Along the lines of yesterday’s post on snare muffling in a live setting, this is a great article about the industry’s preferred snare drums for studio work. 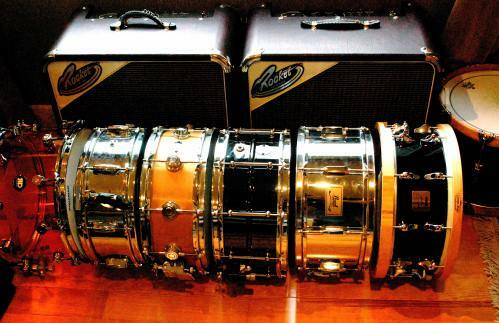 A good snare arsenal is essential for any studio drummer. Read up on it, ya’ll! I’m sure many of you have seen my cut-out drumhead mufflers. I’m a huge fan of the newspaper-on-the-snare trick, and these head cut-outs are my answer for using such a tone in a live performance scenario (where bits of shredded newspaper isn’t desirable). Like a Remo ring, but thicker. And… well… way cooler. These two muffles have slightly different weight grades, resulting in slightly different tones. Recently, through a series of incredible coincidences (stemming from my visit to that Osaka music store), I got in touch with the Japanese drum manufacturer Canopus (pronounced “CAN-ups”), whose beautiful snare drums I used to drool over in Modern Drummer magazines when I was a kid. The company’s artist relations rep came to my gig in Tokyo last night, and he graciously brought me this incredible ash shell drum. It sounds killer, with a timbre unlike any other snare in my roster. I used it for the whole show last night and it worked great both as a cranked up rocker and a muffled fatcake. I’m super pumped to add it to my lineup and can’t wait to get it into the studio. Make no mistake… Risen Drums has my allegiance. But Canopus makes a great-sounding and easy-on-the-eyes snare drum, and the company has offered to cover my Europe/Asia backline needs. I’m very grateful to have begun a relationship with these guys and I couldn’t be happier with this snare. In Tokyo with Takushi Okuyama (goes by “Taxi”) from Canopus. I don’t normally go the negativity route with blog posts, but I was BLOWN AWAY yesterday upon visiting a big-box music store in Osaka, Japan (I forget the name of it now). 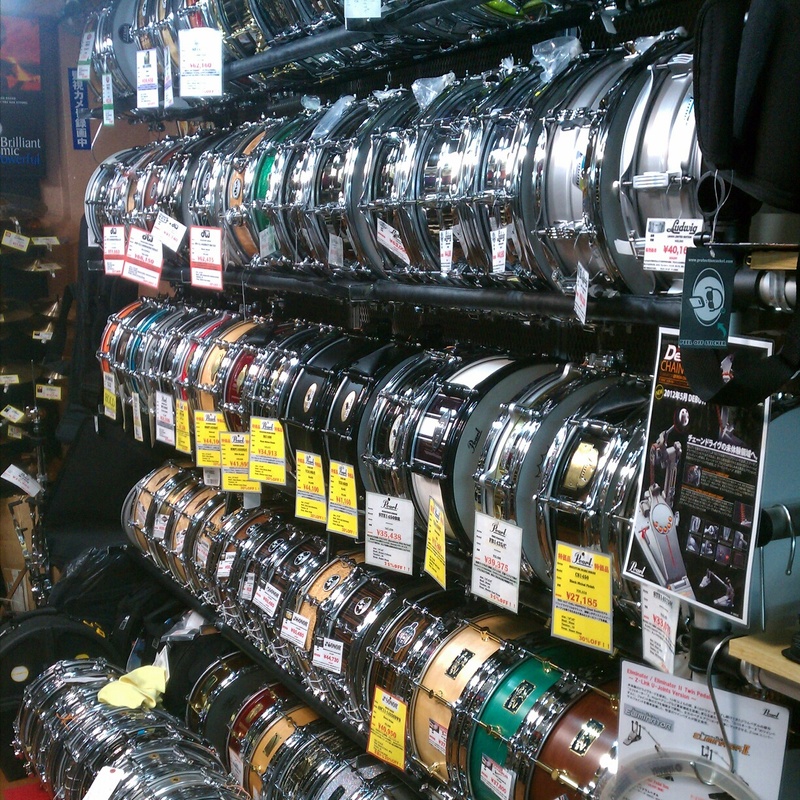 Look at this snare drum selection! … not to mention a ton of nice Tama snares, DW (the real Collector’s series), Pearl, and not a Mapex drum in sight (thank goodness). 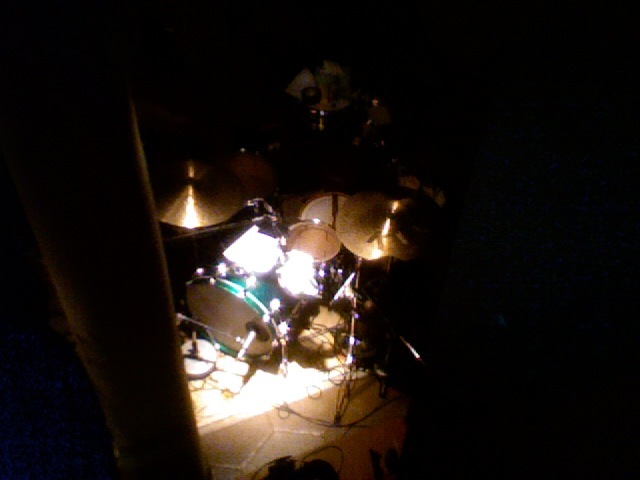 There were MAYBE 5 lower-quality drums. Maybe. I was so pumped up to find such an amazing display of incredible instruments at a big-box store. I’m accustomed to the US approach to massive chain retailers, where stocking anything nice doesn’t make sense because there’s more profit margin in the mid-level or crap-level stuff. Drum Worship “Pacific” models, The budget version Pork Pie and Orange County (real OCDP and Pork stuff is great, but the GC selection doesn’t include that), Joey Jordison Signature snares… these are NOT nice snare drums. Don’t be deceived. Summary: If you want to buy a nice snare drum (which most people do), don’t go to Guitar Center. They don’t have any. Or perhaps they have 2 or 3, but they hide them in the back corner. Instead, save your money, and order something online. Or go to a real drum shop somewhere. Unfortunately Guitar Center has ruined what a “a real drum shop” is supposed to look like. The dimensions of a drum and the corresponding sound is something that I don’t think I fully understand. 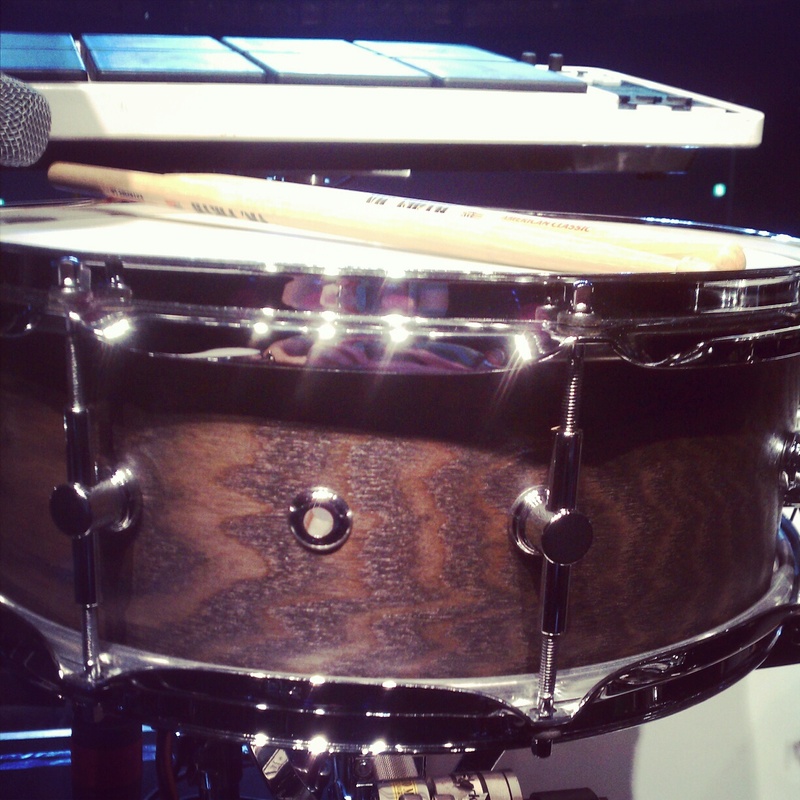 For example, I recently picked up another black brass RD snare (pictured above). All aspects of the drum are exactly the same as the black brass I’ve had for 3 years (also pictured above), except the new one is only 5 inches deep instead of 6.5 inches. The new one sounds so different! Waaaay more sparkle/crack/vibrance. Significantly brighter. I had no idea the slightly smaller depth would have such an impact on the sound of the drum. 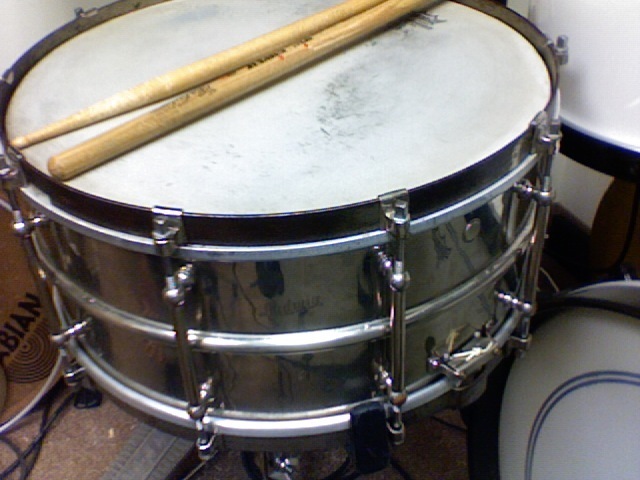 It makes me really curious about some of my other snares and why they sound the way they do. So… I just picked up a legend in drum history. 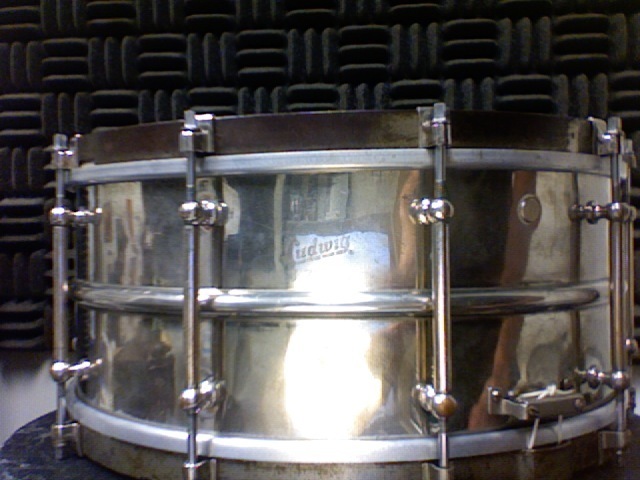 I now own a late 1920’s (or perhaps early 1930’s) Ludwig Black Beauty snare drum. To be fair, it’s not the “real deal.” It doesn’t have the fancy engraving and gold-plating that the standard Black Beauties are known for, and it’s got a few cosmetic flaws that made it affordable for a guy like me, but it’s super rad just the same. Now, all you vintage drum geeks need to help me out with this, because I can’t find very much info online about pre 1977 Black Beauties (Ludwig stopped producing these drums in the mid 30’s and didn’t reissue them again until ’77). I think this one might be nickel-plated brass, which means it’s possibly an anniversary edition or something? Whatever. Fill in the blanks if you know about this kind of stuff. My friend Matt Patrick has a very cool studio in South Minneapolis called Two Pillars, and I’m there today doing a session for the new Elizabeth Hunnicutt record. Tyler Burkum on guitar and Aaron Fabrinni on bass are also playing, which is cool because most of the sessions I do are drums only (recording by myself along with scratch tracks). There’s obviously more fertile ground for creativity when musicians are playing live along with each other. I think the stuff we’ve come up with so far is pretty cool. 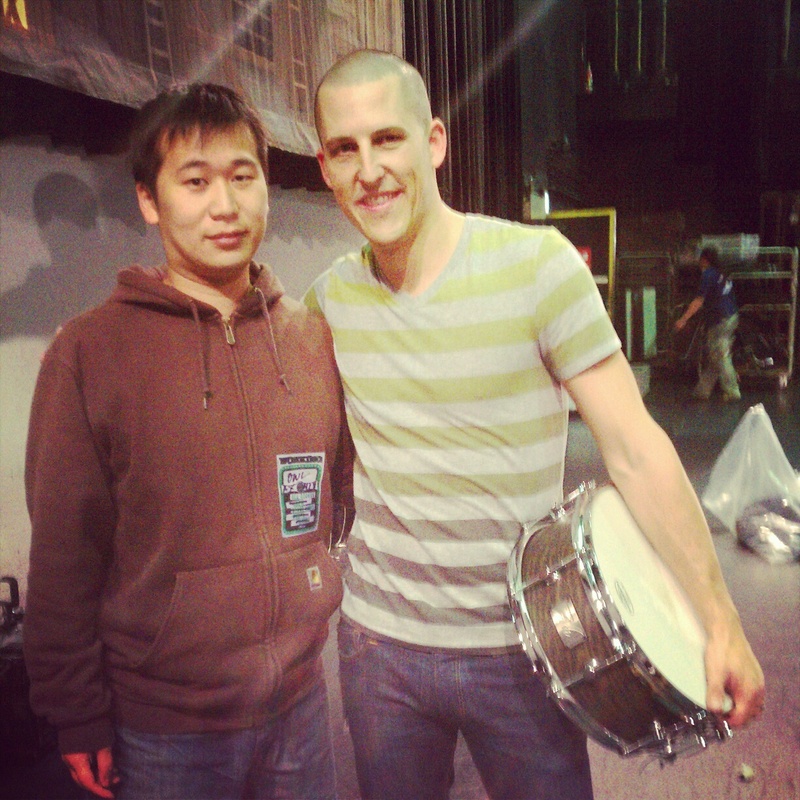 For those of you paying attention, that snare in the pic is the same WFL snare from the Pachyderm pics a few months ago. Man, these days I am really liking that thing. In other gear geekness, I’ve been using this 20″ K Custom Dry Light ride as a crash. It has a really fat but short sound, and the compressed room mics make it sound very cool.